In 1925 his father left the family and his mother moved him, Jesse and younger sister Shirley to her parent’s house in The Bronx. After graduating from Stuyvesant High School in 1932, Robert entered Brooklyn Polytechnic Institute and a year later followed his brother to Cooper Union, but after two years towards a degree in chemical engineering he quit and took a job in radio manufacturing to help support the family. In February 1942, not cut out for academia and unhappy with his job, he jumped at the chance to enlist in the Army Air Corobert_sherman_portraitrp. Being 27, he was older than most of his fellow enlistees. He didn’t drink and was relatively serious. 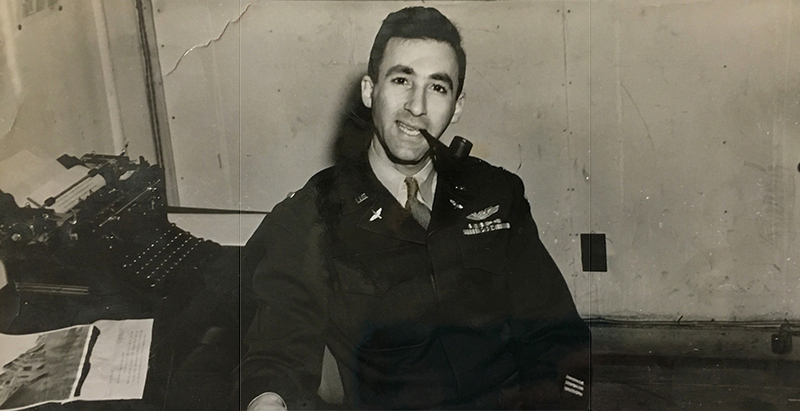 One year later he became a B-26 bombardier/navigator assigned to the 556th Bomb Squadron, 387th Bomb Group and 9th AAF at MacDill Field, Tampa, FL. He arrived at Chipping Ongar, England, with crew #14, B-26 #41-31674 “Los Lobos Grande” on June 26, 1943. Francis Scurr, in the photo standing at ease next to my father beneath the nose of the bomber, remembered that my dad was quiet and kept to himself. Air Transport Command was inactivated on June 1, 1948, and on June 17, 1948 Robert reverted to inactive status in the Reserve. His service separation papers list his permanent mailing address as being the office of J. Henry West in New York City, an attorney involved (as later mentioned in the FBI file) with the start up funding of Atomic Energy Newsletter. Eight months later, on February 14, 1949, Robert mailed out the first newsletter press releases and subscription solicitations. Beginning small in late 1957 but expanding after he stopped the newsletter in 1961, Robert built a successful real estate business, R.M. Sherman Associates, Inc, that he continued for the rest of his life. (He also financially supported Jesse in retirement; for whatever reason, Jesse had not filed patents in his own name on his many inventions, something that never ceased to irk Robert.) Aside from bits and pieces, he rarely talked to his children about his past, and never spoke to us about the newsletter. It was my mother who mentioned he had been investigated by the FBI.